You are here: Home / Tips & Ideas / Decorating Ideas and How To's / How to Choose the Right Subway Tile Backsplash : Ideas and More! It’s budget-friendly. The average kitchen needs 30 sq ft of backsplash. You can easily find FABULOUS subway tiles for under $8 sq ft. So, worst case scenario your tile is going to cost $250 (do not check my math on that one). Best case scenario you’re looking at $60-80. It’s timeless. If you stick with the good old white/off-white in a standard subway tile layout you will get YEARS worth of style out of it. There’s a good reason why this tile has been kickin’ it since the early 1900’s – it’s awesome. Now I realize that not all tiles are created equal. There are some fabulous subway styles in products such as Ham and Cheese, Footlong (hehe, get it? Subway?) Not funny…anyway, there are products such as marble and slate which will, of course, raise the dollar value beyond this budget-busters’ comfort zone. So, when I’m looking for ‘bang for buck’ I stick to the cheap one budget-friendly versions and adjust a few details to add some visual interest for minimal moula. And while subway tile is affordable, practical, timeless, etc… there are also some UBER fab and affordable ways to jazz it up – without spending more money! Traditionally, a subway tile would be porcelain or ceramic but you can get the subway tile PATTERN in any number of products such as marble, travertine, glass and more – so don’t limit yourself to what has always been done, see what else is out there! We chose a beautiful tumbled travertine subway tile for my local client. It complements the warm veins in her granite as well as the natural cherry cabinets (built by her hubby!). Choosing a subway tile in a colour (solid or mixed tones) is a great way to keep things classic and simple, while still adding a personal touch. So whether you love the relaxing colour of sea glass or the textured look of a tone-on-tone tile, you can be a bit more brave with colour when you’re using a classic style of tile. A glazed tile like the one above can add subtle texture to a backsplash. Pair it with a fabulous colour like gray and you’ve got a striking new look! The tile in the above shower has only a slightly glazed look (4×12) and was ALSO installed behind the vanity as a feature wall! You can jazz things up via tile size to add a slightly different look to your tile. We chose an elongated 4×12 cream coloured subway tile for my client’s bathroom and did a staggered layout. It suits the shape of the floor tile (12×24) and the warm tones are softer than the traditional white. With it’s matching grout, this 4×12 off-white subway tile is a subtle complement to the white cabinets and beautiful quartz countertop. My clients were wanting a more contemporary look so we did a standard stacked layout. So seriously, there are MANY more ways to play with subway tile and I’m sure I’ll be writing ANOTHER long-winded blog post on this topic – but for now, that’s it! 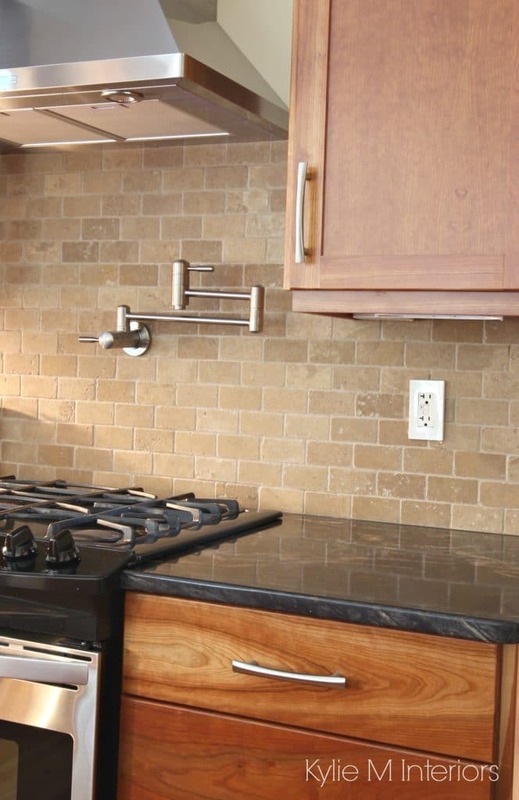 Need help picking the perfect backsplash for your kitchen? Check out my affordable E-design services! Kylie M Interiors Decorating, Design, E-Design Consultation Services. Based in Nanaimo BC Vancouver Island, serving the whole darned World! Completely agree, Kylie! I love the simple, clean look of subway tiles. Have you noticed that many TV commercials with kitchen scenes have subway tiles? You just can’t go wrong. Great suggestions and thank you. Hi Kylie! I’m thinking of using Cambria’s Berwyn quartz. 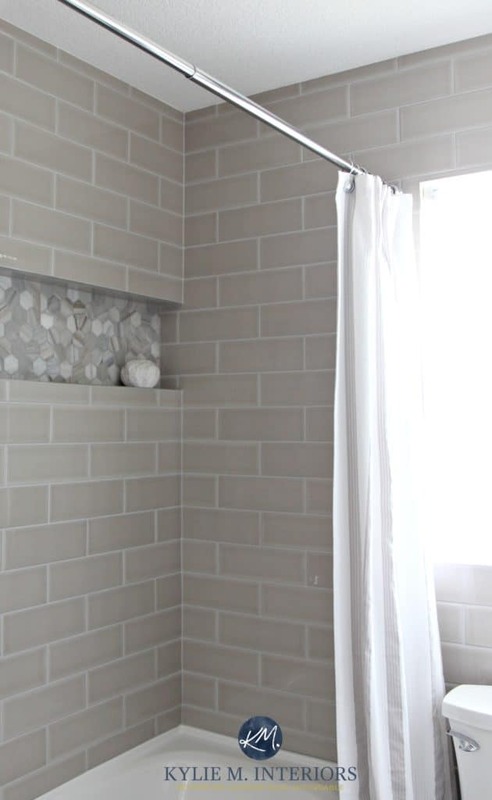 Should I use subway tiles or glass mosaic?What color schemes should I use? My kitchen cabinets are white. Thanks in advance! Hi Arleen, thank you for your note! When it comes to personal questions I actually have e-design packages created EXACTLY for these types of questions. If you’d like to check it out, it’s affordable and fun! 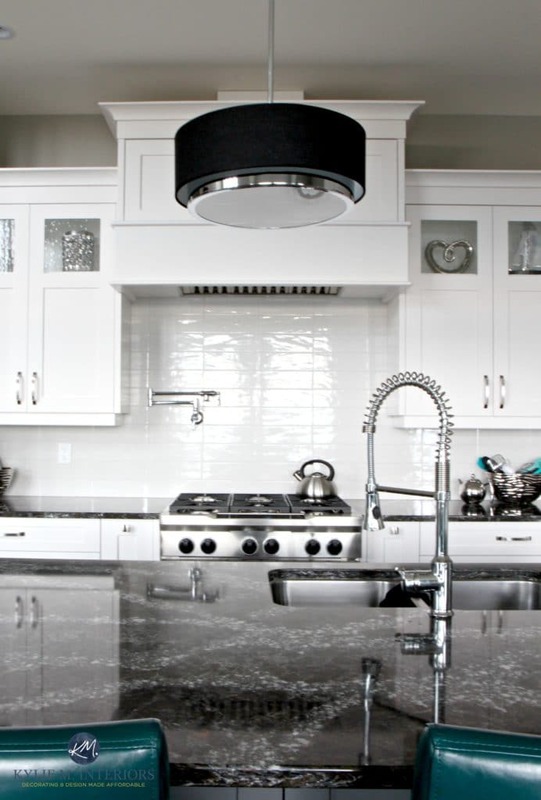 Hi, My cabinets are a antiqued cream, my granite is white w/gray, cream & some purple spots. I am looking for a nice clean subway tile look for backsplash. Should I go w/a cream, linen or a light gray? Hi Cheryl! With this kind of thing it’s always guessing without photos, but I’m inclined to say a cream that ties into the undertone of your cabinets or a gray that ties in to the flecks in your countertop! I’m going to put in white kitchen cabinets by Cliq studios. They only have one shade of white option. Is it ok to install shiny white subway (12″) if it’s whiter than cabinets? I’m going with white Quartz counters that have occasional gray veins like Carrara marble. The counter is definitely white but, again, not as bright as backsplash. I’m worried that the white cabs will look dingy. One professional said it would look good (he had my samples in showroom ) but in my own home’s lighting, it looks different. Darker lighting. I have noticed a trend to use darker grout, six hours as grey even black, with white subway. WHat are your thoughts on that? Is that a fad that will be dated years from now?